If I were to own a retail business, there is only one kind I would opt for: art supplies. To say I LOVE art supplies and art supply stores is like saying I love to breathe. Whenever I go into town for paints I m always full of wonder and dying to try just about anything they carry. And sometimes I actually convince myself that I WILL find time to give new methods and materials a try, so I actually buy them. So, in keeping with my love of new materials, and ways to create images, I have become enamored of my computer, since I also do some work digitally. I love digital cameras, printers, scanners and so on. And what better "material" to covet and get than the new CINTIQ by Wacom? I just bought the 20 inch wide screen and I am in digital heaven. This is about as close to feeling like I am working on real paper with real materials as I have ever felt on a computer. 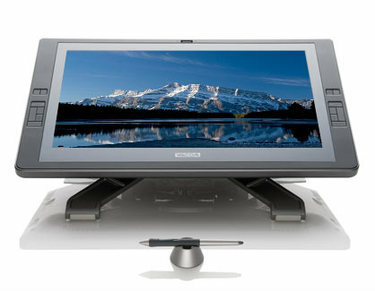 If you are not aware of the Cintiq then check out the videos available. I am telling you--this thing is as good as it looks.